NOTE: this was supposed to go up yesterday, but I had technical difficulties; I couldn’t get an internet connection from the Johannesburg airport in South Africa. Oh, didn’t I mention I was on a business trip in South Africa since last Friday? Sorry … and yes, we’ll be honoring #3 at some point later today. With 4 Days Until Pitchers And Catchers Report, I choose former #4 Ron Swoboda to represent the day — though, with less than 100% conviction. For me, choosing one player to honor #4 was difficult. If I had been born a few years earlier, and had the opportunity to see Ron Swoboda play, I believe he would have been my hands-down, easy choice. And though my policy throughout this series has been to only honor those former Mets I saw on the field with my own eyes, for “Rocky” I’m making an exception — for a few reasons. First, there is this really strange, personal connection I have for Swoboda. For whatever reason, I vividly remember the first time I was introduced to a microfiche machine. Don’t ask me why — I can’t remember what I had for breakfast, I can watch the same episode of a sitcom three times before realizing I’ve seen it before, and I usually forget my age. But in any case, I remember being in the third or fourth grade, going on a field trip to the public library, and the librarian teaching us how to use the microfiche. For those born after Al Gore invented the internet, the microfiche is a film-viewing machine that allows people to read — among other things — newspaper archives going back several decades. After we were instructed on this research device, each student had to find the film container that had the newspaper issue for his/her birth date, pick an article, and write a one-paragraph “research report”. So I found the film can for the week of my birthday, loaded it into the microfiche, and turned the knob until I reached the boxscores listed for April 14, 1970. 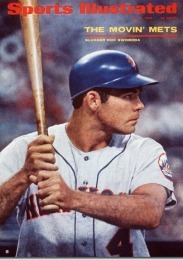 And as it turned out, the Mets lost 6-4 to the Pirates, but Ron Swoboda hit a triple. That was pretty much my report: Mets lost, Swoboda hit a triple. It’s dumb, I know, but ever since that experience, Swoboda has held a special place in my memory. Of course, another image ingrained in my memory is of “The Catch” — the diving, backhanded stab of a line drive by Ron Swoboda in the 1969 World Series (not to be confused with “The Catch” by Endy Chavez or “The Catch” by Willie Mays). Even though I wasn’t yet around to see it live, I must have seen “The Catch” several dozen times by the age of 10, since ’69 Series highlights were shown every time there was a rain delay during a WOR broadcast (usually shown right after the ’62 highlights featuring Casey Stengel yammering about “the children with their placards saying ‘Metsie, Metsie'”). Reading about Swoboda’s baseball career — and later, chatting with him about baseball during a podcast focused on outfield play — I came to realize that he certainly would have been one of my favorite Mets. Though hitting came somewhat naturally, fielding was difficult for “Rocky”, partially because he was moved from the infield to the outfield. He looked awkward chasing fly balls but hustled after everything, usually got to them, and made strong, accurate throws to the right base. From all accounts, he worked extremely hard at improving his outfield play and though he didn’t always look pretty out there, he got the job done. His apprach to the game was fairly simple, and “old school”: work hard to improve, hustle all the time, do whatever is needed to help the team win, and leave everything you have out on the field. In addition to his exploits in the outfield, I’ve been told that Swoboda was something of a “clutch” hitter. When I asked him about that, he downplayed it, suggesting that maybe it just seemed that way, or perhaps the pitchers gave him better pitches to hit because people were on base. Looking at the stats, he did hit nearly 50 points higher with RISP, and almost 100 points higher in “late and close” situations in 1969 — so maybe that’s where the reputation came from. His career stats also show him hitting 40 points higher with 2 outs/RISP and 20 points higher in “high leverage” situations. But enough of the numbers, and back to the memories. I mentioned that there were other players considered to honor this day, so I’ll mention them briefly. First, there is Rusty Staub, who while wearing #4, put the Mets on his back and carried them into the 1973 World Series — and performed well in that Series despite a shoulder so badly injured that he had to throw the ball underhanded. But, Staub also wore #10 so he was honored almost a week ago. Then there is Lenny Dykstra. “Nails” very nearly was honored for this day, due to his dramatic postseason performances in 1986 and his all-out approach to the game. Watching the “smurfs” — Dykstra and Wally Backman — at the top of the lineup always insured some kind of excitement. Finally, my last candidate was Robin Ventura, whose career I enjoyed watching from his time in college (images of him and Will Clark terrorizing pitchers with their Easton Black Magic Bats are etched in my memory). Ventura remains one of my favorite all-time Mets; I only wish he spent more time in the orange and blue. There were some other Mets who wore #4, including Bob Bailor, John Valentin, Jose Moreno, Bruce Boisclair, Chris Woodward, Ben Johnson, and Duke Snider, among others. Which #4 do you remember best and why? Share your memories in the comments. Ron Swoboda was certainly a World Series hero in 1969 and we will have that memory forever. But it should be noted that along with Ed Kranepool, he was one of the greatest disappointments ever to come out of the early Mets’ farm system. His rookie season gave hope that he’d be a 40-homer, 100 rbi hitter even if his defense was below average, but his career was really mediocre. It might have been too much to expect Swoboda and Kranepool to be the new Ruth and Gehrig, but they weren’t even good enough to be full-timers on mediocre teams. As a slugger, Swoboda really didn’t do much at all other than hit some prodigious shots before pitchers learned how to pitch to him. When he first came up, he looked like he would be one of baseball’s top power hitters for a decade, but he never even equalled his rookie year power numbers. 1969 was an amazing year for the Mets, of course, and Swoboda was a big part of it. You might say for that year, he was truly a great clutch player, but his career numbers let all of us old-time Mets’ fans down. But he does seem to be a great guy. I agree with your choice of Swaboda and your regard for Ventura but must note that the Duke wore #11 for the Mets out of respect for former Dodger Charlie Neil who wore #4 on those Mets. ron will always be one of my favorites because it did give all he had and that is all any true fan can ask. he respected the fans i recalled one game when he had four strikeouts and his fifth time up was going for the home run not trying to prevent another strikeout, asked about it afterward he reply that he owed too the fans to try to homer or strikeout. I had the great pleasure of having dinner with Ron Swoboda this week. I’m a little slow, it took me over an hour to find out that the “Ron” across the table from me was him. I’m glad it happened though, because instead of being all fanboy-ish, I got to know him first before we dived into baseball talk. A great guy he is. Well-read, engaging, funny; everything you would want one of your boyhood idols to be. Nearly forgotten behind “the catch” if the fact he drove in the decisive run in game 5 of the ’69 series. I got a ball signed by him on one side, Tom Seaver on the other. The ball sits Swoboda side up above me as I type this. Agreed – Ron is intelligent, engaging, a great storyteller, humble and loves to talk baseball. A truly good guy. Swoboda has the distinction of hitting two 2-run homers off Steve Carlton in a game whare Carlton struck out 19. Mets won 4-2 or 4-3, can’t recall exact score. I know Duke didn”t wear #4 when he first started p laying with the Mets, but he will always be my favorite #4 going all the way back to the Brooklyn Dodger Ebbetts Field days. He was my boyhood hero. I can still picture that sweet left – handed swing as he knocked the ball into Flatbush Ave.